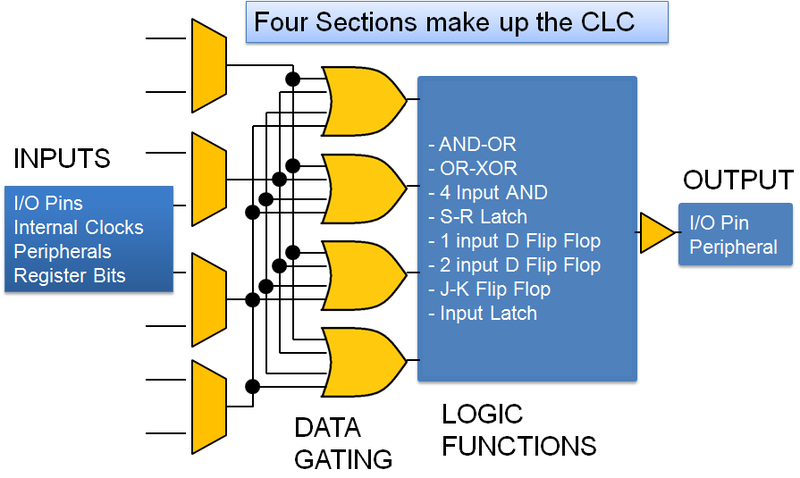 The Configurable Logic Cell (CLC) provides programmable logic that operates outside the speed limitations of software execution. The logic cell takes up to 16 input signals and through the use of configurable gates reduces the 16 inputs to four logic lines that drive one of eight selectable single-output logic functions. The output can be directed internally to peripherals and to an output pin. This video introduces the Configurable Logic Cell (CLC) for Microchip 8-bit MCU devices and shows how to use it. The CLC peripheral has four sections that need to be setup before it can be used. This involves setting up 8 registers in your software program. Once these registers are setup, the CLC will run independent of software control until the registers are changed via software. 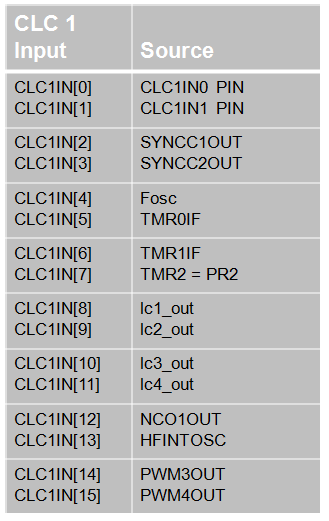 A PIC Device can have multiple CLC's so each CLC module has its own set of 8 registers. The x in the register names above represent the CLC number (i.e. CLC1 uses the CLC1CON register). To simplify the setup, the CLC can be broken down into four sections that need to be configured. Inputs can come from 8 to 16 different sources, depending on the PIC device, and from this list up to four can be chosen to feed the data gating section. The inputs are selected by bits in the CLCxSEL0 and CLCxSEL1 registers. Each input has an associated 3-bit code that is placed in the CLCxSEL registers to enable the input. 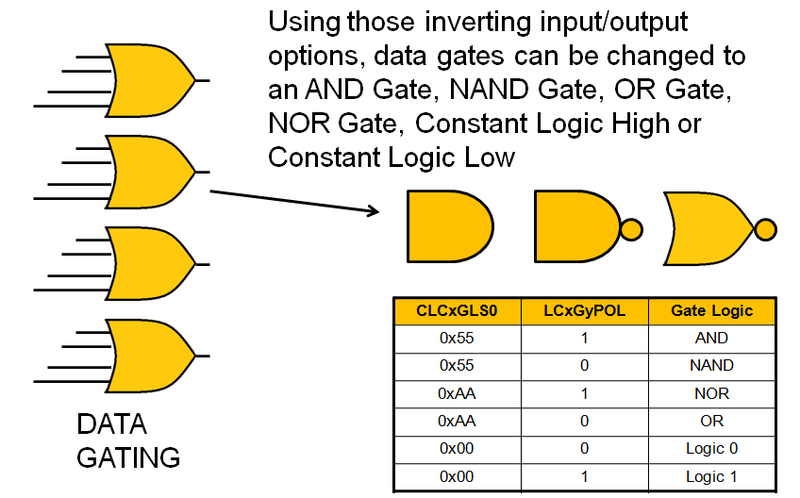 Each gate starts off as a base OR gate but each input and output can be individually inverted or not inverted. 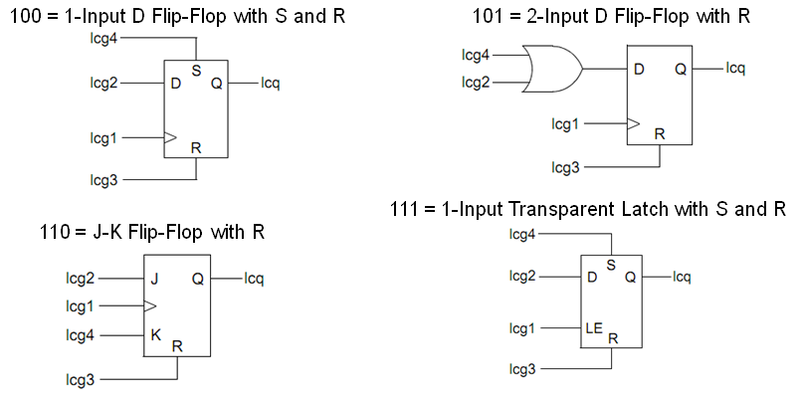 This allows AND, NAND, OR and NOR gates to be created. 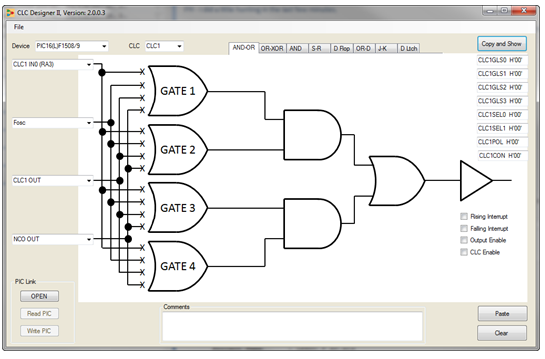 The gates can also be setup to drive a constant 1 or 0 logic level. 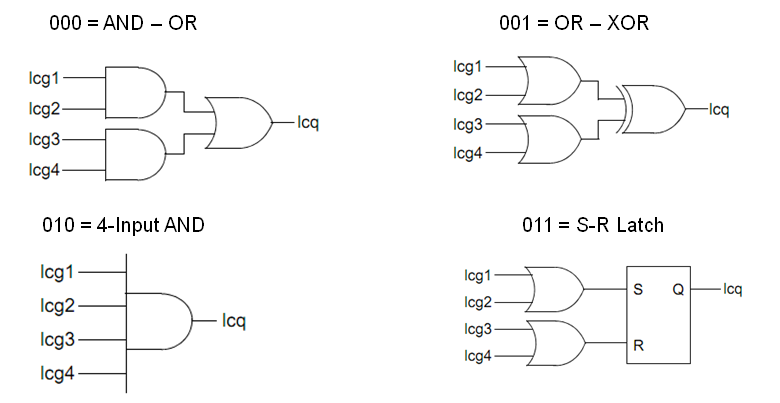 Each input to a data gate has a pair of bits in one of the CLCxGLSx registers. The two bits include a non inverted (T) bit and an inverted (N) bit that need to be setup. If the T bit is set then the input is non-inverted. If the N bit is set then the input is inverted. 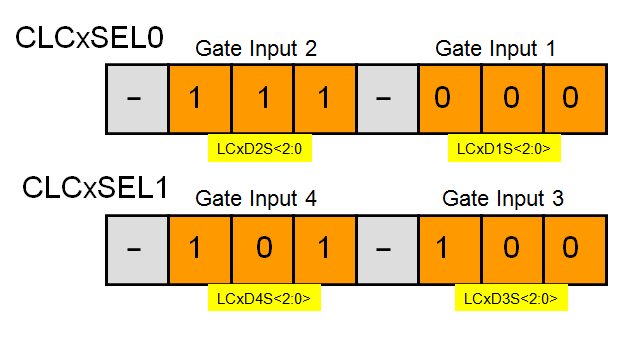 If both are set to zero then the input is not connected to the gate. 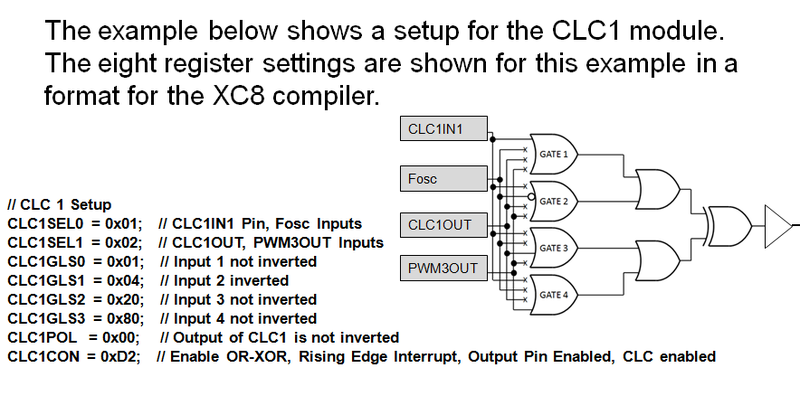 The CLCxPOL register bit LCxGxPOL bit will invert or non invert the output of the gate. The Logic Function has eight options to choose from. It is selected in the CLCxCON register. Each Logic Function has a 3-bit code associated with it. The 3-bit code is set in the CLCxCON register LCxMODE bits to enable the selected Logic Function. 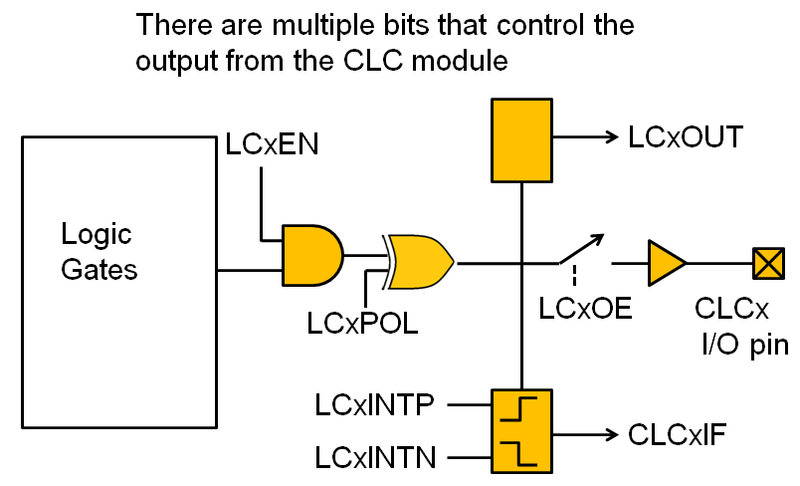 All of the CLC sections reduce down to a single output that can drive an I/O pin, feed another CLC module or internal peripheral or can also trigger an rising or falling edge interrupt. These various options are setup in the CLCxCON and CLCxPOL registers. The bits in the CLCxCON register control the output settings. Here is a simple example that shows the eight registers setup in software to create the CLC setup shown in the picture.